The above info came from reno, and was edited by yours truly (contact me). The image came from Sendoh's Gallery. 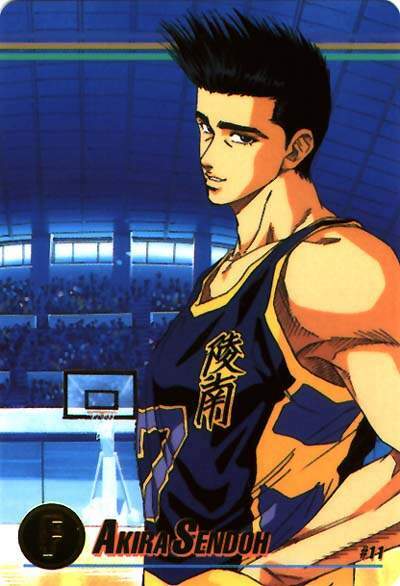 Sendoh is the strongest player on the team. Flexible, talented, he is capable of playing any position on the court and what's more, he plays it extremely well! He is looked up at by most of the players, and is considered more of a captain than Jun Uozumi, even by the latter. He cares a great deal about basketball and is very ambitious in that department: he loves a challenge, and will dare anything to win. On the court, he is a strategic, experimented player but when suitably provoked, all hell breaks loose. On his free time, he enjoys fishing. The above description came from Ryonan - The Fanlisting, and was edited by yours truly (contact me).